Why Choose the Physics Program? Why Choose the Physics Education Program? Resolution adopted by the American Institute of Physics, the American Physical Society, and the American Association of Physics Teachers (Physics in a New Era: An Overview, National Academy Press, Washington DC, 2001). The Physics Education Program at Wright State currently consists of K-12 teacher preparation and college-level reforms. The program in Physics is part of the Science Education program of the College of Science and Mathematics in conjunction with the College of Education and Human Services. The science education program at Wright State is somewhat unique in that most of the science educators hold joint appointments in the two colleges. In addition to the academic year program, faculty conducts summer institutes for in-service teachers. 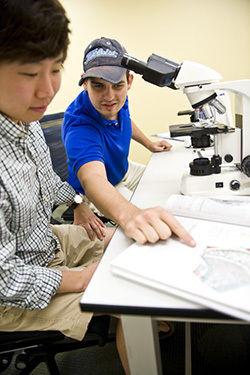 View Bachelor of Arts in Physics, Physics Education Concentration program information, degree requirements, and graduation planning strategy in the University Catalog. Current students at Wright State University who are interested in adding or changing their major can also be admitted into the Physics Bachelor of Arts degree program by meeting the above criteria. Find Next Generation Science Standards on the Achieve website. View A Framework for K-12 Science Education: Practices, Crosscutting Concepts, and Core Ideas on The National Academies Press website.